More than four decades ago, a lone architect had what must have seemed at the time like an impossible dream: to build a new kind of residence that would be in complete harmony with the planet. This home would be made with recycled and sustainable materials. It would rely on clean energy and renewable resources to supply its inhabitants with the most basic and essential of needs. It would be designed to be affordable and utilize construction techniques that are so simple that anyone could build it. This vision was the beginning of what is now known as the Earthship – a remarkable feat of sustainable living. The environmental, economical, and ethical reasons for living in an Earthship – or any self-supporting home for that matter – are abundant. Whether you are breaking ground on a new home or would like to incorporate these concepts into your existing dwelling, read on for a breakdown on the principles of the self-sustaining home. Despite the fact that the size of the average American family has shrunk from 3.3 people per household in 1960 to 2.54 in 2014, the demand for larger homes continues to grow. Between 1973 and 2013, the median size of brand new single-family dwellings rose by 55%, up from 1,525 to 2,384 square feet. Traditional construction practices have a tremendous impact on the natural environment, and the larger the home the more resources and energy it requires to build and maintain. Building materials are a source of indoor air pollutants, which can be two to five times higher than outdoor pollution. And, of course, it costs more money to power, heat, and cool such a large space. To eliminate the environmental impacts of construction (it takes about ¾ of an acre of forest to build a conventional home), building materials should be recycled, salvaged, locally available, renewable, durable, and above all, have a negative carbon footprint. The Earthship’s primary building materials are scrap automobile tires, aluminum cans, and glass bottles encased in rammed earth – an ancient method that creates strong, non-combustible walls. This allows the structure to achieve thermal mass, which efficiently keeps the home warm in winter and cool in summer without the need for separate heating and cooling systems. The idea of salvaging materials that would have otherwise languished in a landfill is ingenious, but there are other options available when building a green home. Borrowing from prehistoric times, modern cob homes are made with soil and straw, are inexpensive to build, and are fireproof and earthquake resistant. Another is the hemp house, constructed with Hempcrete – a mixture of industrial hemp, lime, and water. Vegetation rooftops, or green roofs, reduce heat loss and stormwater runoff while cleaning the air. And although thiswaste house was constructed with 85% trash – like DVD cases and toothbrushes – you can also source recycled materials from deconstructed buildings at marketplaces like PlanetReuse. Last year, the United States consumed more than four billion kilowatt-hours of electricity, 67% of which was derived from fossil fuels. Moving away from coal and natural gas toward renewable and clean energy sources is becoming more and more accessible, as technological innovations and falling prices continue to make small-scale, off-grid setups practical and affordable. Solar power, wind power, or a hybrid of the two are all viable choices, depending on site orientation and location. Solar photovoltaic (PV) systems work most efficiently in the southwestern states, but denizens of almost any region can benefit from a solar array, provided the site receives direct sunlight. Wind maps can also help predict the mean annual wind speeds in your geographic location. There are many factors to consider before deciding on a renewable energy system, but once set up it will reliably supply your home with clean (and free!) electricity. According to the UN World Water Development Report, if global demand for water holds at the current levels, we would face a 40% deficit in just 15 years. Bleaker still, water shortages in the U.S. are anticipated for 40 of 50 states within the next 10 years. Unless a sea change in how we use and treat this precious resource takes place, water scarcity will very soon be a fact of life. Rainwater harvesting offers an independent solution to regional water shortages by collecting precipitation – including snow – on a catchment surface, like a roof. From there, water is gravity-fed into a cistern, then channeled into a pump system (for water pressure) and filtered (for potability). Solar water heaters can be installed to take care of most, if not all, of your hot water needs; a backup natural gas or biodiesel on-demand water heater may also be used as a supplement. Now here’s where things get really eco-friendly: after the potable water is used for showering, laundry, cleaning, and so on, it is collected and recycled three more times. This “grey water” is generally composed of bits of food, soap residue, cleaning products, dirt, grease, and hair. Large particles are filtered out before it is routed to the greenhouse (more on that below) where it provides irrigation and nutrients to edible plants. The garden soil and plant root systems naturally clean and filter the grey water, and once this is accomplished, the water is again collected to supply transparent, smell-free water to flushing toilets. 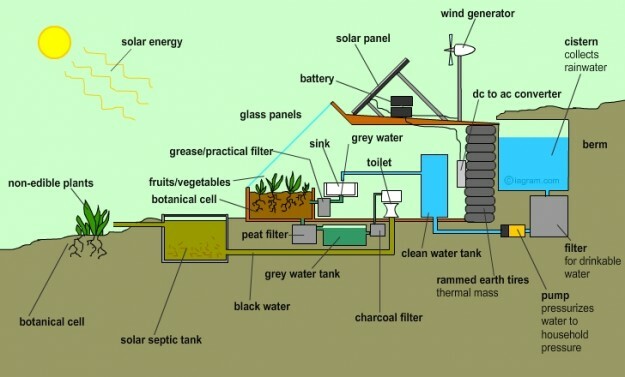 Lastly, the flushwater from toilets, referred to as “black water”, is contained and treated in a solar septic tank. Black water can be funnelled to a drain field or used for outdoor irrigation for non-edible plants. A visual representation of this marvelous setup can be found here. The crowning touch of the Earthship is the ability to grow your own organic food, year-round. Since Earthship is a passive solar design, south-facing windows are necessary to absorb heat from the sun. This wall of glass makes the perfect spot for fruits, vegetables, herbs, and flowering plants, with a growing area large enough to feed a small family. The household’s grey water, which is nitrogen-rich and completely safe for food-bearing plants, is automatically pumped to the indoor garden – and that means considerably less daily upkeep. When using grey water for irrigation, it’s best to clean with products that are natural, biodegradable, and non-toxic. Read Next: Activist Buys Old Truck And Converts It Into Mobile Shower For The Homeless… Take A Peek Inside!